To view, edit, add, and delete entries on the back-end of your site, go into your form and click the "Entries" tab. You may use the "Switch Form" dropdown directly above the list of entries to manage entries for a different form. This page works very much like the WordPress post listing pages. You can show or hide field columns on the entry listing page if you are running v3.1 of WordPress or later. Select the "Screen options" tab at the very top of the page to customize which columns are shown. The entries listing page for a specific form includes a box to search the entries. Searching with or without a field selected may return different results on some forms. After a search, the results can be exported to a CSV using 'Download CSV' button above the entries table. To search, type in a search term, and click the "Search" button. You can search All Fields, or search by Entry Creation Date, Entry ID, or a specific field. Entry creation date - Search by entry creation date to get a list of entries created in a specific month or year. The search results are currently based on UTC time. When searching by Entry Creation Date or a Date field, use the YYYY-MM-DD format. To search entries created during the year 2017, type 2017 into the search box. To search entries created during January 2017, type 2017-01 into the search box. To search entries created on January 5th, 2017, type 2017-01-05 into the search box. User ID - Select the user ID field in order to search for a user email or login name. A post field - When a field is not selected, the title and post content for any linked posts will be searched. In order to search values in a custom field, select the field for the search. A dynamic field - Select the dynamic field to search for a value rather than the id of the linked entry. If you would like to edit an entry from the back-end, hover over the first column on the Entries page and select "Edit". When you are editing an entry from the back-end, you can change any field values, including the Entry Key and the User ID. Additionally, in v 2.03 and later, when editing an entry in a multipage form, you can now save the entry from any page in the form by clicking the 'Save' button instead of clicking through each page in the form to update the entry. Each entry automatically includes a timestamp when it was created. This entry creation date will be saved in UTC time, and displayed in the timezone and format selected on your WordPress Settings → General page. 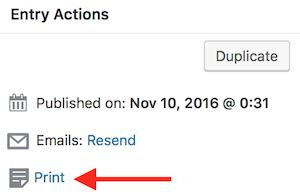 When viewing an entry on the back-end admin area, you will be given an option to add a note/comment. These notes/comments can only be added and viewed on the back-end by anyone with access to view entries on the back-end; they cannot be edited once they are created. The comment will appear as shown below, allowing for a new comment to be created. Learn how to set up notes/comments on the front-end. A benefit of printing an entry from the back-end of your site is that it will not print everything you see on the webpage, but rather only the pertinent information to your form entry. If you would like to print an entry from the back-end, follow the steps below. 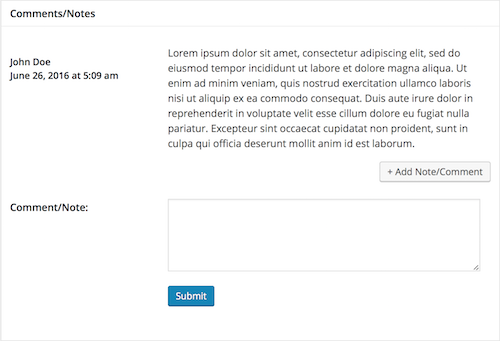 Or learn more about how to style WordPress form submissions for print for front-end printing. Go into edit the form you would like to print entries from. Go into the 'Entries' tab. Click 'View' on the entry you would like to print. Click 'Print' in the Entry Actions box. Formidable data, including entries, are stored in the WordPress database. A great way to know about the Formidable data in the database is to open up your WordPress database and look at the different tables. From there, you can view the data and see how it all works. Read more about the Formidable database schema. The security will depend on how you set it up and your web host. If you have international (EU) clients, read more about how Formidable handles the GDPR requirements. You may add new entries on the back-end of your site. This gives you complete control over the information submitted, including the Entry Key and User ID. Simply select the "Add New" button at the top of the Entries page, fill out the form, and hit Submit.